Mr. Abrams quipped about the UAE’s newly-found assertiveness in a mail to Mr. Al-Otaiba: "Jeez, the new hegemon! Emirati imperialism! Well if the US won't do it, someone has to hold things together for a while.” Mr. Al-Otaiba responded: "Yes, how dare we! In all honesty, there was not much of a choice. We stepped up only after your country chose to step down," a reference to perceptions that President Barak Obama had been disengaging from the Middle East. Discussing the UAE’s relationship with Saudi Arabia and Prince Mohammed, Mr. Al-Otaiba went on to tell Mr. Abrams that "I think in the long term we might be a good influence on KSA (Kingdom of Saudi Arabia), at least with certain people there. Our relationship with them is based on strategic depth, shared interests, and most importantly the hope that we could influence them. Not the other way around." 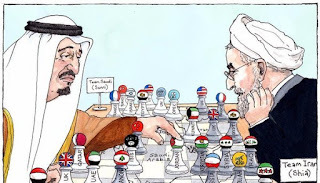 Mr. Indyk’s description of Prince Mohammed’s endorsement of US engagement with Iran also contrasted with the Saudi official’s framing of his country's rivalry with Iran in sectarian terms in an interview on Saudi television in May. Prince Mohammed asserted in the interview that there could be no dialogue with Iran because it was promoting messianic Shiite doctrine. The Saudi overtures also appeared designed to strengthen Shiite forces that seek to limit Iran’s influence. They also aimed to exploit the fact that a growing number of Shiite politicians and religious figures in Iraq were distancing themselves from Iran and could emerge strengthened from elections scheduled for next year.